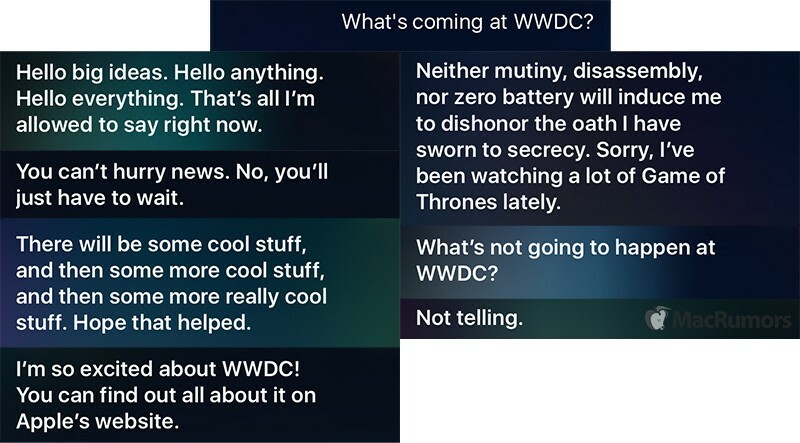 Ahead of Apple's WWDC 2016 keynote next Monday, June 13 at 10:00 a.m. Pacific Time, Siri is now offering up some traditionally witty responses to users that ask about potential announcements. iPhone users can test Siri themselves by asking "what to expect at WWDC?" or similar questions. All of Siri's responses are unsurprisingly vague, including one related to the popular HBO drama series Game of Thrones. Each response includes a link to Apple's WWDC website, which provides a schedule of events and other details about the weeklong developer conference at Moscone West in San Francisco. Siri previously revealed that WWDC 2016 would be held on June 13-17, prior to any official announcement, and offered similar "give us a hint" responses leading up to its September 2015 media event last year. As is usual, Apple is expected to unveil the latest versions of its iOS and OS X operating systems for iPhone and Mac respectively at WWDC 2016. Few details are known about iOS 10, but possible features include a Siri SDK for third-party apps, a redesigned Music app, deeper artificial intelligence, slight user interface enhancements, and more. Apple is also potentially working on a feature to allow users to hide or delete unwanted stock apps that could feasibly debut in iOS 10. A headline feature of the OS X update is expected to be Siri on Mac, allowing the personal assistant to be used on the desktop for the first time. Apple has also briefly referred to the operating system as macOS on multiple occasions, suggesting that the OS X name could be retired after fifteen years. New versions of watchOS for Apple Watch and tvOS for Apple TV could also be unveiled, possibly alongside announcements related to services like the App Store, Apple Music, Apple Pay, and iCloud. Multiple reliable sources have indicated that WWDC 2016 could be a no-hardware event, although Apple could still make a few surprise announcements. Leading up to WWDC, Thunderbolt Display stock has been limited at Apple Stores in the U.S. and abroad, naturally stirring speculation about a possible refresh to the five-year-old standalone display. Some have speculated that Apple is working on a 5K display with an external GPU, but the product has been ruled out for WWDC 2016. Despite multiple sources claiming that Apple will not refresh its notebook lineup until much later in the year, a new report said the company still plans to announce new MacBook Air and MacBook Pro models at some point in June -- not necessarily at WWDC. The new MacBook Air models would allegedly ship to retailers in August, while no release date was specified for the new MacBook Pro. Apple's next-generation MacBooks will likely be equipped with Thunderbolt 3/USB-C ports, while USB-A, MagSafe 2, and Thunderbolt 2 ports found on existing models will allegedly be removed. The notebooks are also expected to have faster Skylake processors and metal injection mold-made hinges. The 2016 MacBook Pro in particular is expected to feature a thinner and lighter form factor, Touch ID, AMD's new 400-series Polaris graphics chips, and a new OLED touch bar positioned above the keyboard. Leaked photos of what appears to be the notebook's unibody reveal space for the OLED touch panel and four USB-C ports. Meanwhile, in April, Apple analyst Brian White made a sketchy prediction that a 20% to 40% thinner Apple Watch 2 could be unveiled by June, possibly lining up with a WWDC announcement. However, more reliable KGI Securities analyst Ming-Chi Kuo said the Apple Watch 2 will debut in the fall alongside the iPhone 7 with a focus on internal upgrades and possibly cellular connectivity. Apple will be live streaming its WWDC keynote on its website for iPhone, iPad, iPod touch, Mac, Apple TV, or PCs with Microsoft Edge on Windows 10. Apple also offers an official WWDC app on the App Store. MacRumors will be providing live coverage prior to, during, and following the keynote on Monday. Learn more about what to expect by reading our WWDC 2016 roundup. When is Siri going to become vaguely useful? if it was a dog, they would have had it put down by now. Hey Siri, "What's coming at WWDC?" "Tim Cook is announcing his resignation. Let the celebrations begin!" Genuinely, I can't wait for the day when you write a positive comment about Apple. I think I might have to screenshot it and pinch myself. Hope Siri gets a proper update and not some minor tweaks here and there. Cortana is really ahead of Siri and Google Now right now. Spewing out silly jokes is all that Siri's good for. Google's AI is running circles (and beating Go champions) around Siri. While Google was buying DeepMind AI, Tim Cook and Eddy Cue were buying BEATS urban fashion brand and made billionaires out of bunch of rappers. Well a talking dog would be good, if it talked sense... its like that game where you ask a question and you answer a difference question. while its funny for a while..... soon gets old. I dunno. I don't think I'd ever get tired of a talking dog, even if it talks nonsense. Witty responses are annoying distraction for incompetence.